Gigantic waves that can level coastal communities demonstrate nature’s enormous power. Tsunami sprung from disturbances underneath the ocean such as volcanic eruptions and earthquakes. They may also occur after a huge meteorite impact or a nuclear testing where large amount of water are displaced, creating a ripple effect that reaches the shore. 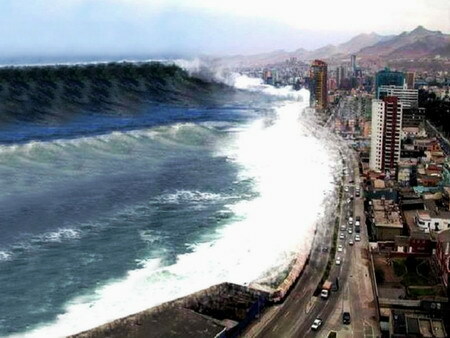 Man-made tsunami is possible although it is not as strong and massive as the one caused by nature. Typically, tsunami can be seen as a raging tide, hence the name “tidal wave.” But this term is somewhat misleading since they are not caused by tides or the interaction between the earth and moon’s gravitational force. Rather, it is a wave formed by the displacement of water from the epicenter moving towards the shore and back. One of the most common cause of tsunami is the subduction fault between tectonic plates of the earth’s crust. As the plates move towards each other, one of them eventually slips underneath. Sometimes it can get stuck, creating huge amount of tension that builds up overtime. And then snap! The plate breaks loose releasing all the tension and creating a massive earthquake and subsequently, a tsunami. Underwater disturbances such as volcanic eruptions are also one of the leading causes of tsunami. The upward thrust of the explosion causes the water to rise momentarily, high enough to generate a devastating tsunami. In deep waters, this may not be observable, but comes thundering as it reaches shallow waters. It moves at an incredible speed and eventually slows down. Depending on the distance through which the wave travels and the intensity of the earthquake, a tsunami’s can be either weak or strong. The further it has to travel the weaker it gets. Minor tremors underneath the ocean may not cause a tsunami at all. The first indication that a tsunami is about to happen is the occurrence of earthquakes. People living in the coastal areas need to be aware of the danger of tsunami whenever tremors are felt beneath the earth. Sometimes the epicenter of an earthquake is so distant that only slight earthquakes are felt. However, this may mean a huge tsunami is on its way, so it is good advice to evacuate as soon as possible to a higher elevation far from the shore. this certianly helped me with my english research project, it informed with so much info. it was helpful in my sst project………. This helped a lot. However, you should expand your information onto other information about tsunamis in greater depth. I loved this website, because it explained it in a way I could understand perfectly. Thank you so much.